A Mayfield Heights bar is so fed up with the way the Browns have been playing that they are now refusing to show the team's games. 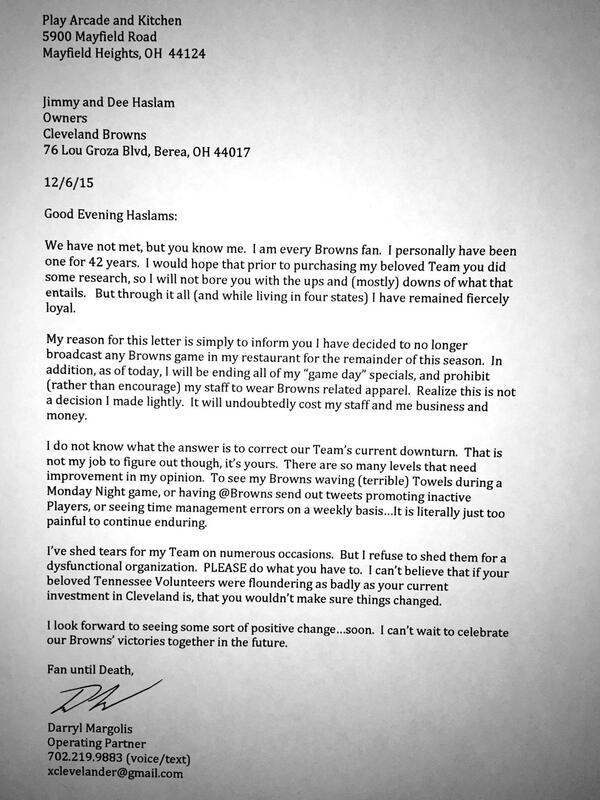 One of the operating partners of Play Arcade and Kitchen, Darryl Margolis, penned an open letter to Jimmy Haslam telling him, "it is literally just too painful to continue enduring." "We have not met, but you know me," he began the letter. "I am every Browns fan. I personally have been one for 42 years. I would hope that prior to purchasing my beloved Team you did some research, so I will not bore you with the ups and (mostly) downs of what that entails. But through it all (and while living in four states) I have remained fiercely loyal." He continues to say that, even though he will probably lose business and money, he can no longer shed tears for a "dysfunctional organization." More than 203 people have 'liked' the photo of the letter posted on the bar's Facebook page. Margolis ends the letter by saying that he will continue to be a fan "until death" and "can't wait to celebrate" Browns victories in the future. Next up, the Browns take on the San Francisco 49ers on Dec. 13 at 1 p.m.